150 years ago, the Civil War was winding down, the struggle between emigrants and Indians on the Rocky Mountain frontier was ramping up, and an ancestor of mine, John Benton Hart (right, with his brother Hugh), was in the thick of it all. Late in life the man they called “Johnny” dictated vivid memories of war and peace in the last days of the taming of the West. In this anniversary period I am shaping these hitherto unknown eyewitness accounts into articles, to be followed by a book. 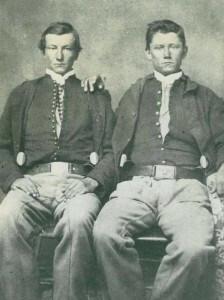 The first installments of Johnny’s story, telling of the Civil War Battle of Westport near Kansas City in October 1864, have run in the Kansas City Star Magazine and the journal Kansas History. The next chapter, to appear in the Spring 2015 Kansas History, treats a celebrated battle with Sioux and Cheyenne at Platte Bridge (now Casper, Wyoming), on July 26, 1865. Here is new testimony on the death of Caspar Collins, for which the Wyoming town is named, and the scalping of Cheyenne chief High Backed Wolf. Johnny’s wanderings will next take him to one of the hottest corners of the region, Montana’s Bozeman Trail, where he carried the mail between forts in the middle of Red Cloud’s War, and eventually to his homestead in the place still called Harts Basin, near Delta, Colorado.